Can you recognise the common link between these biblical stories? Answer – the magical number 40!! Many spiritual traditions speak of a set of common themes interwoven into the notion of ‘40’ – ritualistic cleansing, purification, prayer, inner reflection, stillness in preparation for a renewal of spirit and ultimately a re-birthing of the light within. 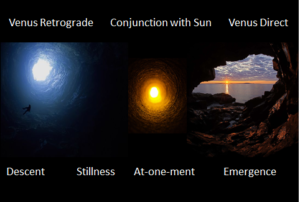 The internalised conflict and testing of each stories ends with an orb of light bathing the seeker in a glorious radiance of light; having emerged from a cave, mountain top or desert illuminated, enlightened and at peace. All traditions also agree that the time it takes for your spirit to be renewed and sense of hope and awareness emerges comes to 40 days! Our stories are ultimately cosmic ones. Our predecessors believed that our humanity is embedded within a vast field of intelligence, interlinking the above with the below. Their stories, our myths, retained the knowledge of our stellar origins encoded in the lives of those who have inspired our spiritual traditions. The 40 day purification ritual is none other than the story of the Light Bearer, Venus. You cannot have but noticed that brilliant bright blue/ white light reigning high in our evening skies over the past nine months. That has been Venus. 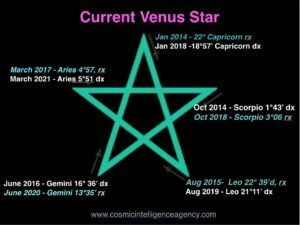 In this, her maturing phase of her overall life process, she has been called the Queen of Heaven and Earth, or in less romantic terms, the Evening Star. You will notice that her light dims and her height above the horizon shrinks as she mirrors the aging process heading through the last few weeks of her life, before she merges with our star, the Sun on the 26th October, where she will become reborn, starting her life cycle over again. This is a process that takes place every 18-20 months as Venus appears to reverse her motion in our evening skies, thereby staying longer in a particular region of the zodiac than she normally would. This process allows her to transmute light thereby facilitating a re-birth of the archetypal pattern associated with that sign. This conception, or Renovatio, takes place during the midpoint of this reversal process, which happens on the 26th October, when Venus couples (conjoins) with the Sun. eal’ concerning the creation of conditions on the earth to house a new form of love-consciousness that will infuse within our personal and collective psyches of the coming next 8 years. Just as the skies above reflect the earth below, this rekindling of the Solar Feminine on the 26th October marks a 41 day inner journey during which you are prompted to travel alone, in the dark; to face yourself and humbly strip yourself of your feminine ego; to seek atonement and ultimately raising the consciousness of your femininity to a level that better enables you to fully embrace your feminine Light. This process has three stages to it – a descent into the underworld; a merging with spirit and the subsequently spontaneous experience of atonement; and an ascent back into the world of matter and form re-invigorated, en-light-ened and inspired. As Venus initially descends into the beams of the Sun, disappearing from our evening skies, as she seeks to obliterate her sense of self and merge with something much vaster than herself, she starts to become engulfed with a luminous hue. This gentle light is something that you will notice with those you know who have managed to shed their desires and attachments. As Venus appears to approach the Sun she becomes completely surrounded by Light. Engulfed by the Sun’s rays she will no longer reflect her own light as she is suffused with the Light of Spirit. This alignment symbolically depicts the process of shedding all earthly attachments and desires as the light of consciousness cleanses and en-light-ens the Spirit, generating an aura, or halo, of pure blue-white light in the process. The conjoining of these two celestial bodies is the origin of the Angelic Halo that surrounds those Beings whose have reached a stage of growth that embodies pure love AND pure consciousness. Similarly as the descent into the depth of your inner world deepens and quickens, the process of shedding and lightening accelerates. The same is true for Venus in her light-cycle. During the mid-afternoon hours (in Dublin) on the 26th October as Venus aligns with the Sun, the midpoint of this “40 day” process has been reached. Venus is now completely surrounded by the stellar light, engulfed by His rays and will no longer reflect His Light as She is literally infused with the Light of Spirit. The Light Bearer literally re-communes with Source, mirroring the coming together of being-consciousness and heart-consciousness once again, signifying the reawakening of the Solar Feminine. If you have a good memory, the themes that are emerging for you now are rooted in the heart-forms that you created some 8 years ago between October 8th and November 18th 2010. Subsequently there have been four further re-births of differing value-ideals during the periods of 15th May to 27th June 2012, 21st December 2013 to 31st January 2014, 25th July to 6th September 2015 and the 4th March to the 15th April 2017. Whilst those times have coincided with changes and renewals of other values, the specific issues you are now dealing with relate back to 2010! Those values you birth during the union of the Sun and Venus on the 26th October 2018 will hold a resonance for you over the coming 8 years, so I would encourage you to make conscious what ideals you hold dear as they become manifest as living breathing entities in your life over the years to come. Therefore, this 41 day journey is therefore an ideal time to turn away from both your world and the intense challenges that are emerging in the world in general throughout the Autumn of 2018 and to reflect on what heart based themes that were forged back in 2010 and what, if any, changes you now need to make, so that your consciousness can en-light-en. 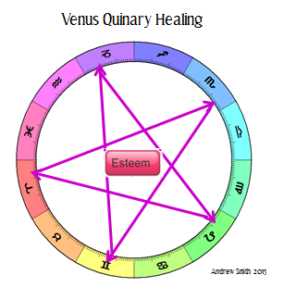 You will notice that when we trace Venus’ kiss with the Sun over an eight year period, as seen from the Earth, a pentagram is traced. This quinary symbol is a powerful healing symbol which when combined with a pure intention, will enable you to bring into manifestation your true heart’s desire. Therefore I would ask you to hold space during the Cazimi for a dimension of the Venusian archetype within you that feels lacking in joy or balance. If you are not familiar with the expression of Venus, I would like you to cast your eye over the words contained within the Venusian Bubble map, reflecting on the emotions and images that are triggered by those words, focusing specifically on how those words have been for you over the past two years of your life. If you find that a particular word, or concept, feels currently uncomfortable, pause and take a note of that word. During the first stage of this process, from the 5th October through to the 25th October, wherein you descend into your dark, stripping you of your ego-mind, I would like you to meditate and hold a space around the themes in your life that arise associated with that word. Can I ask you to reflect how that concept is manifesting in your life and specifically when you interact intimately with those in your life? Do you really value that side of yourself? Do you take the time to nourish that part of you? If not, why? As you merge your light with that of the Divine Light on the 26th October, this day is one to set constructive intentions concerning your Self-love, Self-valuation and Self-appreciation. I would ask you to hold a space for the aspect of this Venusian archetype within you that feels lacking in joy, balance or integration. Visualise that word, or an image that that word invokes for you; place it inside an imagined pentagram, mirroring the quinary symbol that Venus actual will make through space/time on the 26th October; and let the synergy of this Renovatio replenish the light around this un-integrated part of yourself. As you ascend back into the world of matter and form you can start to see the fledgling seeds of the intentions set germinate and sprout in the world around you as create reality with your replenished light-essence. 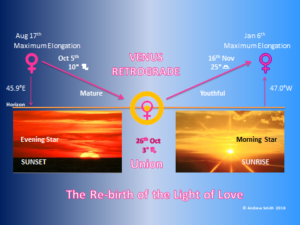 So to summarise, the Venus Retrograde Cycle ultimate is a time wherein we experience a Transmutation of Light. It is a time when our consciousness is replenished and re-vitalised as Love fuses with Light. Venus’s decent into the beams of the Sun heralds a process wherein the dark of the ego is literally blasted away by the light, since dark cannot exist in the light. All aspects of your soul that keep you separate from joy and light are released and as love connects with Source, your Light flourishes. Thanks again for taking the time to either read to this article. All rights reserved – www.andrewsmith.ie www.cosmicintelligenceagency.com and Andrew Smith. Completed at 06:00 BST, 5th October 2018. Your Feminine Light is not about being more womanly or female. It refers to one side of the Primal Pair – a Yin, or the In-Breadth, and Yang, the Out Breath. 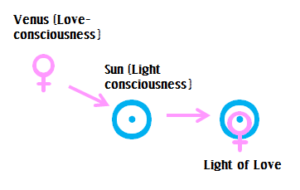 As such the Feminine Light refers to the active development of your inner value system; it concerns itself with the flow of love and light; the ability to attract people and things towards you; your sense of peace, value, community and communion; and your experience of intimacy (personal and platonic).